Our wrought iron furniture is handcrafted with care in Mexico. 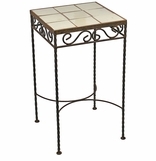 These iron tables, bar stools, wrought iron beds and ice cream parlor tables and chair sets are perfect for any rustic southwest, Mediterranean or Spanish colonial decor. Each piece is hand forged and constructed with care by Mexican metal craftsmen. See all of our Mexican wrought iron accessories, rustic hardware and furniture in these additional categories. Iron Lamps and Lighting Fixtures: Great additions to your rustic iron furnishings! Tuscan Style Iron and Copper Furniture: Large selection of beautiful and ornate iron work furniture with hammered copper tops!